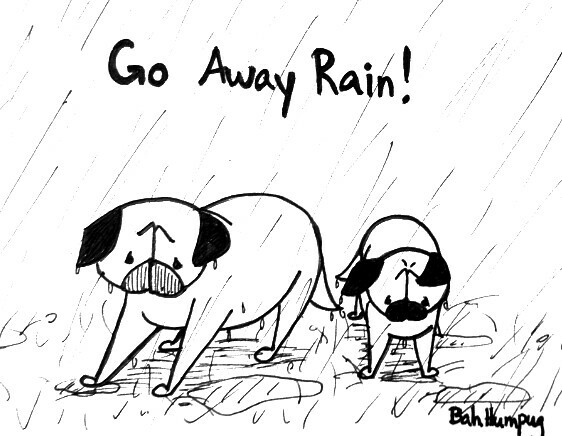 Bah Humpug: Go Away Rain! It's been raining cats and dogs since yesterday evening and none of us are pleased with it. Not to mention that while taking the girls on our last walk of the night yesterday and getting drenched the power went out. Being outside really late on a stormy night alone when it suddenly goes completely dark is not fun and we scurried back inside. My whole apartment smells like wet dog and this morning Sunny reinstated the hated poo strike. So rain, please go away. If not for me, then at least for the sake of Sunny's bowels.